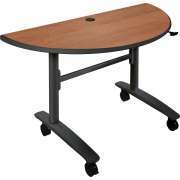 Create an efficient work or study environment with great computer lab tables that combine ergonomics, functionality and style. 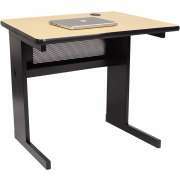 Hertz Furniture offers a variety of computer tables including mobile and height-adjustable options. A selection of styles, materials and colors enables you to choose the configuration that is ideal for your space. How should a computer desk be organized? 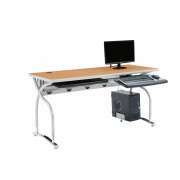 A computer table should be arranged in a way that makes all components easily accessible. 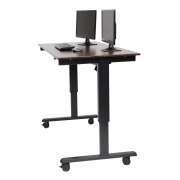 Increase the comfort, health and productivity of students, staff or employees with Hertz Furniture&apos;s wide range of computer stands, computer lab tables and computer carts. How can I eliminate clutter on my desk? Built-in wire management makes a computer table much more user-friendly. Cable-management grommets eliminate clutter and facilitate easy routing. The less wires students or employees have crowding the desktop, the easier it is to work efficiently without distractions. The optimal plan for a long row of computers that are plugged into a main powerstrip will also incorporate a wire-management tray. 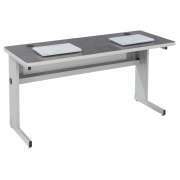 A tray directs wires from individual workstations directly to the power source without tangling. This eliminates the hazard of tripping over dangerous cables on the floor. 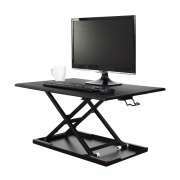 How can I set up an ergonomic workstation? 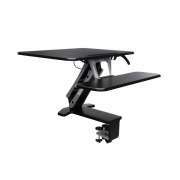 In addition to built-in features that are integrated into the computer table structure, there are many convenient accessories that can greatly enhance a computer desk. A pull-out keyboard tray eliminates crowding on the desktop and helps keep hands in the optimal ergonomic position for typing. Another excellent option for setting up an ergonomic workstation is an attached CPU holder. 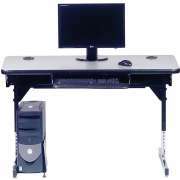 Depending on the configuration of the computer table, the CPU holder may be attached to the inside of the table leg underneath the work surface or on the outside of the leg. Both arrangement options keep the CPU secured in an easily-accessible upright position. 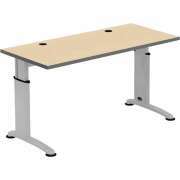 Which computer desk will fit my desktop? 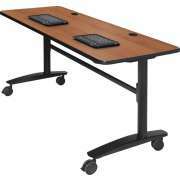 Computer tables come in a variety of shapes and configurations. 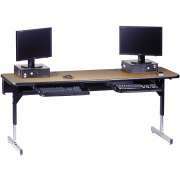 The right computer desk design depends on what kind of desktops you have and how many you need to fit in a given space. 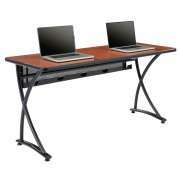 To outfit an entire computer lab or training room with many rows of computers, two-person workstations are a good option to consider. Corner stations maximize the computer capacity of a room. They are especially useful if tables are lining the walls.The trapezoid-shaped table is a great alternative to classic shapes as well. 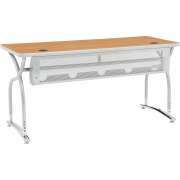 And of course there is always the classic option of single-student workstations, which provide personal workspace. Whether you choose one- two- or multiple-student workstations, it is important to make sure that the dimensions fit your space so students can utilize technology in the classroom comfortably. 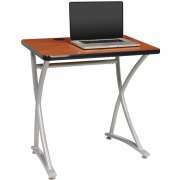 Like work surfaces, computer table legs come in a variety of styles, all of which have their own advantages. The classic four-legged style is available as well as t-legs and cantilever legs. 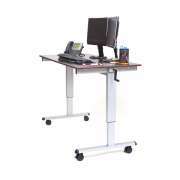 T-shaped legs provide firm support while leaving a bit of extra legroom under the worksurface. Cantilever legs offer maximum legroom. Even if a CPU holder is attached to a cantilever leg, there will still be plenty of space under the desktop. 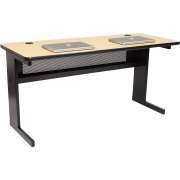 What are the best tables for a school computer lab? 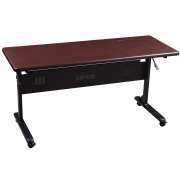 Adjustable-height tables are the optimal choice for schools that serve children of many ages. Adjustable legs offer greater flexibility because they can be adapted when tables are used to serve children of different ages or sizes. Many computer table styles also include a mobile option. 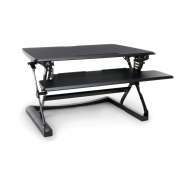 Casters simplify table transport for easy relocation. This greatly decreases the risk of damage to people and equipment in the process of moving. Computer carts in schools can turn any classroom into a center of technology and educational innovation. 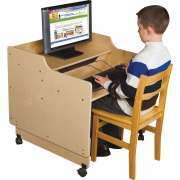 How can you make a computer desk more comfortable? Although they may not be a necessity, there are additional design features that can greatly enhance a desktop-user&apos;s experience and make working at a computer table much more comfortable. A flip top makes it easier to arrange and route wires below the work surface. Flip-top tables also save space in storage. Some flip-top models can be nested together to conserve area in a storage space. Modesty panels are an appropriate enhancement for training rooms. They hide the area underneath the work surface, which creates a more dignified and organized look. Although we have already discussed many aspects of computer desks that must be considered before purchase, there are still additional factors to consider as well. If you have already purchased computers or chairs, it is important to make sure that they match up with your new furniture. Chairs with arms might not fit underneath the surface of all desks, so it is a good idea to verify that the desk and chair heights match up. Additionally, laptops and desktops come in many shapes and sizes, so the optimal computer stand for your devices might vary. Hertz Furniture is here to help you with every step of your computer table purchasing process from selection to ordering to installation and beyond. In addition to our expertise and experience, we also offer an extended warranty on most models. So while your computers might become obsolete over the years, you can be sure that your workstations will endure through many technological revolutions.